Ever since Justice League concluded last year there has been debate and speculation as to where and when, if ever, we'll see Ben Affleck's Batman back in the DC universe. Well, certain fans are convinced that they've spotted him in a new trailer for Titans. Or at least the silhouette of him anyway. If this is anything more than wild hopefulness, it opens a whole host of interesting questions that are, at the very least, worth discussing. First, let's dig in as to what fans think they see. 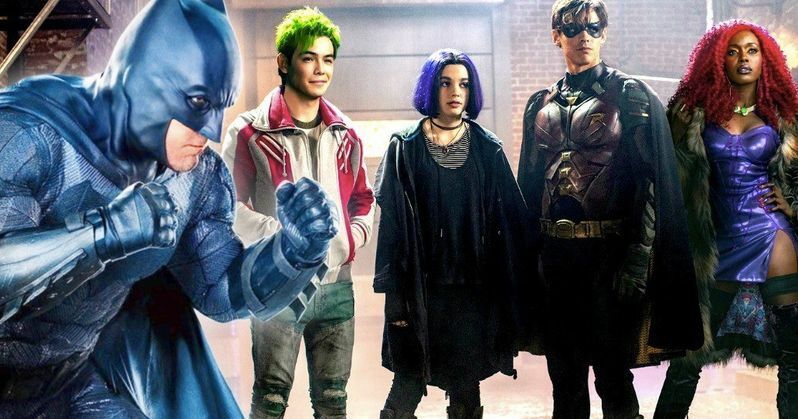 Recently, DC released a promo for this week's episode of Titans, which is a live-action series that airs on the DC Universe streaming service. The trailer is spray paint style animation coming to life against a white background. At roughly the eight second mark, one of these shapes takes the form of something looking suspiciously like Batfleck, with Robin's shape seen within the alleged figure's frame. When looking at side-by-side shots of the trailer moment against actual shots of Ben Affleck as Batman, it's hard not to see where fans are coming from here. And it's worth mentioning that this is a universe that Batman certainly exists in. The first Titans trailer had the now-infamous "F*** Batman" line, and without the Caped Crusader, there is no Robin. But what version of the character exists in the Titans universe? That's the key question that needs to be answered before anyone gets too carried away when looking for meaning behind this Batfleck-resembling figure. Up to this point, Warner Bros. has kept small screen DC separate from big screen DC. And nothing in Titans so far has connected to the world of movies like Justice League. Speaking in broad terms, there's no reason they couldn't do such a thing, if they really wanted to, but it would create a whole host of problems. Warner Bros. is retooling DC Films and has been rethinking their strategy to try and get things back on course. That's still very much a process that is evolving. Adding in the notion of making everything from Titans and the upcoming Doom Patrol series canon in that universe would really complicate things. Not to mention how complex and unlikely it would be to get Ben Affleck to appear on the show in what would probably be nothing more than a glorified cameo. Let's not forget that it looks like Matt Reeves is going to make The Batman without Ben Affleck, even though the studio hasn't dished out any official details on that front. Including him in Titans, even if they could make it happen, would only muddy up an already very muddy situation. All of this to say, this figure fans are seeing, though it may look a lot like Affleck's Batman, at most, is a fun Easter egg that means nothing more. Be sure to check out the Titans trailer in question from the DC YouTube channel, as well as some tweets from fans who are convinced of what they've seen below. This is really good. Please make the Titans show DCEU canon and the Doom Patrol show as well. Plus give us a spinoff with Hawk and Dove.